Having spent much of my childhood on my grandparents farm this was a bit of a nostalgic trip for me; although my family weren’t sheep farmers by the time I came along their concerns were the same. Farmers work 7 days a week, long hours and not necessarily for much return; it’s a vocation and a hard one. But it is a rich life and although this film shows the hard realities, rubbing a live orphaned lamb in the gore of a stillborn one to fool the ewe into taking it on for example. It also highlights the fun and laughter. There is a lot of love and good humour in the Hutchinson’s lives and the kids go about their share of the work as best they can. Watching Jack , Esme and Hetty dutifully shutting the gates took me right back to my youth; ‘always close the gate’ being one of the many phrases still ringing in my head along with ‘don’t play in the corn’ (not one that the Hutchinson kids need to worry about). In one of the scenes set in the local village school a handful of children are talking in class of what type of farms they live on (the Hutchinsons are tenant farmers, an insecure position to be in) and what sort of jobs they might want to do when they grow up; inevitably for most of them it is farming. This is a way of life that has gone on in this region for hundreds of years. 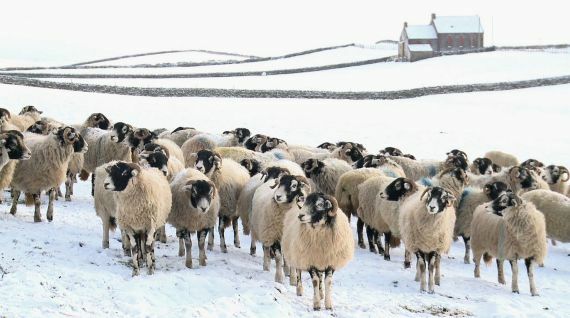 An observational documentary that manages to get close to its subjects and give the viewer a real insight into their lives; neatly packaged up into seasons by which every farm must run Addicted to Sheep is whimsical and heart-warming. It’s not often you get to see a film like this in the cinema but it’s an important document of a life that is receding into the past in this country; catch it while you can.